In this workshop, participants will learn about different optoelectronic components (photodiodes, photoresistors, phototransistors and photoelectric cells) and how they can be used to create sound from natural or electronic light sources in our everyday world, as well as from lasers and other modulated light sources. Circuits to drive motors in order to create hand-drawn spinning "tonewheels" will also be shown. All places are now taken! Derek Holzer [USA 1972] is a sound artist who has performed live audiovisual sets using laptops and the Pure Data programming language since 2001. Becoming frustrated with the performance limitations of the computer, he began new experiments with all-analog, light-driven systems in the summer of 2007 which led to the TONEWHEELS live performance. Since then, TONEWHEELS has been performed in Germany, the Netherlands, Sweden, Italy, Estonia, Poland and Belgium. The development of human eyes for the reception of radio waves … is quite inconceivable… the real difficulty lies in the much longer wavelengths of the radio spectrum, which make the accommodation of a directive aerial array, or antenna, a difficult problem. In fact, in any reasonable sized animal the aerial system would probably determine the appearance of the animal to the exclusion of all other features. Wave-length proposes an open exploration of the physical characteristics of various wave phenomena: sound, light and radio, with the latter two encompassed under the heading of electromagnetism [EM]. Wavelength in all instances has a direct relationship to oscillation and thus frequency, to resonance and to any form of change in time and in space. In the case of radio waves, wavelength is translated into a highly physical architecture of antennas, dishes and arrays approximating patterns of reflection and refraction. Whispering galleries and sound mirrors provide inspiration in the audio realm. These domains can also be mapped to the microscopic, with diminishing wavelengths, microwaves, leading into a light which literally colours perception. Wave-length acts as a guiding principle of scale and measure with detection or exploration determined by the quasi-scientific expansion of sensory apparatus. The wave-length workshop will explore both sound and EM phenomena from a spatial perspective: the construction of a landscape of antennas, oscillators and detection or measurement devices using simple materials. Participants are welcome to bring any materials or objects for wavelength exploration. Please email m@1010.co.uk to reserve a place. A new horizon has been opened, outdating the separation of transmission and reception that had been forced upon electronic media. The Ghost and the Leech actively explores alternative radio constructions, ranging from powerful transmission devices (1W+ FM), which can well extend the range of personal broadcast, through the psychophone [Franz Seidl] for time/space dislocation, to simple parasitic gadgets, harvesting power from radio waves [fernsehturm]. Participants will construct a selected device, gaining knowledge of simple principles and methodologies. The workshop proposes an imagination which extends beyond "free radio", "natural radio"; an inserted ghost question for polymorphous radio prosumers, Berlin's new Raketenmensch ["live forever, in a clean, honest, purified Electroworld"]. … two communicating devices are involved: a "leech" and a "ghost". Phantom power extends Ghost and Leech explorations of alternative radio constructions, ranging from powerful transmission devices (1W+ FM), which can well extend the range of personal broadcast, through the psychophone [Franz Seidl] for time/space dislocation, to simple parasitic gadgets, harvesting power from radio waves [RFID // Fernsehturm]. Participants will construct a selected device, gaining knowledge of simple principles and methodologies. This second workshop proposes an imagination which extends beyond "free radio", "natural radio"; an inserted ghost question for polymorphous radio prosumers, Berlin's new Raketenmensch ["live forever, in a clean, honest, purified Electroworld"]. Participants need not have attended the first workshop. Fritzing is a free software application that helps you realise your electronic ideas. The intuitive interface allows even beginners in electronics to document and design real devices and eventually produce professional or DIY printed circuit boards. Bring your laptop and build one of our nice sample projects. Or feel free to bring any unrealised projects and ideas. We'll show you how it works and help you etch your own circuit board. This project is based on an early experiment in sound recording, where a water jet was used to amplify and record sound onto a wax cylinder. A laser (rather than a water jet) can be used to amplify and transmit minute inaudible sounds. With this technique it is possible to hear the sound of light through modulation and reflection. For example it can be used as an instrument able to detect the high frequency modulations from electronic light, or to create techno beats from a bicycle light. By using a modified laser projected through a droplet of fluid - or 'Fluid lens' - it is possible to create a sensitive microphone. If this lens also contains microscopic creatures, their movements will generate sound by creating distortions with the movement of their body and antennas. The lens also responds to subsonic architectural 'sound’. During the workshop participants will investigate the use of solar cells and other light sensitive components to generate sound from light, use lasers and LEDs to transmit sounds, use liquid droplets to create sensitive microphones and use liquids dynamic physical oscillators [chemical oscillation and cymatics]. Antony will also demonstrate the muio interface, biofeedback experiments and both mlog and ilogs from the owl project. Please bring laptops or sound recording equipment if you can. It will be useful to bring sonic material or patches that could be used for generating sound for transmission. Sound cards, mixers, mic-preamps will be useful for experiments but not essential. Antony Hall is a multimedia artist with an interest in freshwater biology, biophysics, electronics, and the physicality of sound. Working within contexts such as universities and museums, often in collaboration with scientists. He is interested in how we interface with science & technology; visually, physically and ideologically; and how these interactions effect us creatively and socially. Exemplified by an ongoing collaborative work with the owl project producing a hand crafted wooden laptop computer (the Log1K & iLog) among other instruments. He has also worked with electrogenic fish, harnessing their ability to communicate and navigate with electric fields, creating an artwork controlled by the live fish (ENKI). syn-er-gy | noun | the interaction or cooperation of two or more organizations, substances, or other agents to produce a combined effect greater than the sum of their separate effects. A one-day workshop in which we explore synergies in the form of very direct and one-to-one relationships or mappings between sound and image. The claim is that your music will turn out completely different as you cross map with visual elements. And vice versa: your graphics will look different as you code them to sound better. Audiovisual mapping is a treasure chest of inspiration for control, generation, organisation and systemisation of sounds. We will be using the free software SuperCollider and, as a springboard, the article 'Audiovisuals with SC' (http://www.fredrikolofsson.com/f0blog/?q=node/316). You will learn how to make up your own synergies. Intermediate level - some familiarity with SuperCollider required. You should at the least know how to run and modify code examples. Fredrik Olofsson, aka. redFrik, is a musician and developer who also sometimes performs tricks with visuals and electronics. the conversion of nonelectrical properties of the object being photographed into electrical ones… with a direct transfer of charges from the object to the photographic plate. Kirlian photography effects a transition or translation, a series of exchanges which are subject to varying, over-determined interpretations. Photographic emulsions and imaging techniques are explicitly opened to the electromagnetic, acting as a medium for another form of perception, an exchange primarily between biologic systems and presencing or bringing to light. open_kirlian is the first in a new series of working groups projecting the intense, collective one day investigation of diverse research fields relating to core concerns. The open_kirlian working group will explore the domain of Kirlian photography, from the production of a high frequency, high voltage supply, through experimentation with varying photographic processes and techniques towards the assessment of Kirlian process images using [in]organic specimens under varying conditions. Participants are welcome to bring relevant documentation, high voltage supplies or components, digital or analogue cameras or materials, objects to be imaged within the Kirlian process. All participants take part at their own risk. The working group will briefly present the afternoon's research at 8PM. All welcome. 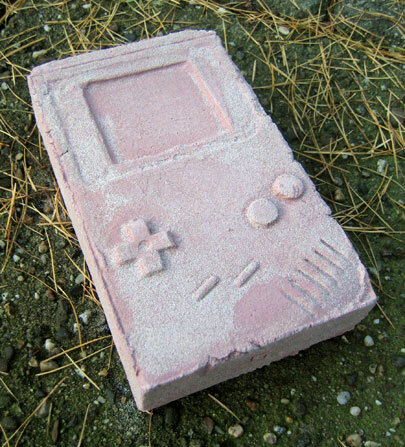 In the future all information might be lost on what a Gameboy is.. so then people can still see the Gameboy and wonder what it was used for… That's why I buried the Gameboys as a symbol of what archeologists might find in the future. Hardware and software imply control. Wide ranging process is transformed into logic to be embedded within complex (control) systems of economy and being. Control is a promise for the future which is already betrayed by cheap, consumer electronics and desktop-bound software. Data and circuit bending, crash and glitch, celebrate the loss of control. Industrial designer Gijs Gieskes bends and constructs a vast panoply of convertors, translators, sequencers, and controllers morphing signals, web data, music, video, software icons, game levels for performance and play in the no man's land of contemporary control. The one day construction workshop will involve basic electronics and simple scripting for the control of consumer electronic devices using microcontrollers, Arduino, and throwaway logic chips. Participants will also be able to build the hard-soft synth with a kit from Gijs. The workshop will close with Gijs and participants in performance either at micro_research or a venue TBC. any electronic devices… if it runs on batteries we can give it a try. An Arduino board is also recommended (available from http://segor.de in Berlin) but we will also have all parts available to build a simpler (free) equivalent. About the teacher: Gijs Gieskes is a industrial designer, mostly busy making devices that do things… Often these devices make music. Ultrasound, ultrasonics or hypersonics specifies a domain beyond hearing, beyond or breaking a necessarily arbitrary limit of the audible (around 20 KHz), with a relation to the visible. Ultrasound implies a revealing of space (the rangefinder, echolocation techniques employed by bats, whales and fish), exploration and penetration of opaque media (diagnostic sonography), as well as a rendering opaque through the creation of fogs from the interaction of higher frequency pressure and various liquids. Hypersonic phenomena produce psychological reactions and are implicated as transmission means within the conspiratorial world of mind control and the other breakthrough of EVP/ITC. Crossing this audible boundary, ultrasound inspires a domain transformation, a potential for transmission and reception, and an interference which can be explored within sound making and audiovisual cross border investigation. Experimenters within this workshop will build and play with ultrasound transducers, amplifiers and frequency converters. The workshop will close with all participants in open Nacht performance at micro_research [9PM]. Fee: 10 euros (inc. all parts, food). Performance: free. open_kirlian is the second in a series of working groups projecting the intense, collective one day investigation of diverse research fields relating to core concerns. Following the construction of a pulsed high voltage supply during the previous session, investigation will focus on varying photographic processes and techniques towards the assessment of Kirlian process images using [in]organic specimens under varying conditions. Participants are welcome to bring relevant documentation, digital or analogue cameras or materials, objects to be imaged within the Kirlian process. The process will be documented during and after the workshop. All participants take part at their own risk. Inspired by the revolutionary work of Nikola Tesla and within the frame of a recent series of investigations (open_kirlian, ghost and the leech), artist and engineer Alexei Blinov hosts an open, practical workshop exploring high voltage phenomena and wireless energy transfer. The nature of both signal and modulation (laser light, radio broadcast) will also be examined in the context of EVP (Electronic Voice Phenomena) and Breakthrough. Alexei Blinov is a Russian born artist/engineer living and working in London. He was and is strongly involved with wireless community networking. His areas of expertise include sensors, lasers, hardware design and programming. He has created his own projects as well as working with many artists and groups such as Take2030, audiorom, Tanaka, Hobijn and others. Bring your computer and join us as we make algorithmic paintings, live sensor drawings, numeric designs, cliché machines, simple games and indelicate instruments! … Polaroid film can be employed to map the fields directly in less than five minutes. The method is both convenient and inexpensive. The intensity of a field can be measured by simply holding the film in the path of the waves. 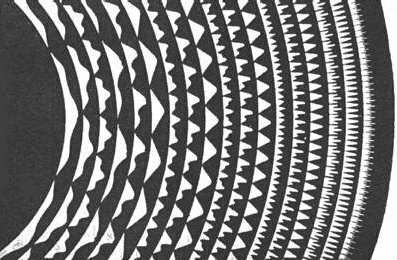 Inspired by the work of professor Keigo Iizuka in the late 1960s, Saturday's open working group will explore photographic imaging of the fields of both ultrasonic waves and microwaves. A variety of wave generating setups will be used with super-cooled, pre-exposed film in an experimental attempt to record wave patterns of frequency dependent phenomena. Participants are welcome to bring sources of both microwaves (eg. wireless card with antenna) and ultrasonics. This workshop is concerned with the re-use of VGA/CRT monitors as experimental devices. It covers basic considerations of electronic vacuum technology, particle acceleration, de- & re-construction praising the empty space. Danger, sparks & entertainment! Practical experiments will be performed including VGA signal generation, interference, signal injection, modification, graphical animation without computer. Additional monitors, equipment and Arduino-equivalents will be available. Jamming Through Runtime, a day-long workshop at _____-micro_research, expands and extends Valentina Vuksic's Trip(ping) Through Runtime, inviting participants to join with both intrusive and non-intrusive interventions into otherwise hidden, interior processes of laptops and computer motherboards; a theatre or symphony of hard and soft audio interactions. A collection of elderly laptops is being examined via magnetic pickup microphones. The microphones transform the magnetic waves around the various electronic parts of the computers. Each action upon the laptops can be sensually experienced through a broad range of layered sounds. Already plugging the power and booting up an operating system reveals an own small-scale universe of sounds and provides insight into the complex spare room emerging between hard- and software. This space is being explored and further modelled by triggering actions on purpose. System analysis tools, stress tests and custom c-programs shall bring the characteristics of each machine into the limelight. "Tripping Through Runtime“ is part of a longer-term study, diving into the invisible interrelationships of hard and soft computer matters by sensual means. The project aims at provoking and detecting specific behaviour of individual computer components in match with adequate software pieces. The microphone demonstrations are part of the first experiments to become acquainted with the hardware components. Valentina Vuksic [CH] studied New Media Art at the Zurich University of the Arts and Information Systems in Germany. Important works have included Harddisko, a noise and disturbance amplifier system for harddisks, and Sei Personaggi Part 2, a play in computers. micro_research hosts two parallel RFID-inspired workshops with Marc Boon. The RFID sniffer is a simple analog electronic circuit which can detect the presence of 13.56 MHz RFID tags. These tags are commonly used in all kinds of plastic cards like access badges, bank cards, library cards, public transport passes and so on. The RFID sniffer is a fully self-contained circuit on a credit card sized circuit board, including battery. During the workshop you will build your own RFID sniffer, under my guidance. RFIDuino is an Arduino shield for reading and writing 13.56 MHz RFID tags. These tags are commonly used in all kinds of plastic cards like access badges, bank cards, library cards, loyalty cards and so on. RFIDuino consists of a 65x65mm circuit board, which plugs onto a standard Arduino (NG, Diecimila, or Duemilanove). The board contains the antenna and all circuitry to read and write to RFID tags. It is connected to the Arduino using I2C, using the Wire library. For the RFIDuino workshop please bring Arduino (or equivalent), and laptop. Spiced food will be freely available. Please note this will be the last workshop before Breakthrough workshop/event 24/25/26/27 June, restarting in July! In this workshop you will find out about the emerging art form of livecoding and learn how to write simple scripts to create animations in 3D space. After an introduction to the scheme programming language and how to use it to build shapes and animate them, you will be let loose on prototype game code for groworld - a game still in production which takes elements from guerilla gardening, permaculture and plant growth. Cost: 10 euros (including food). The pick was [then] used to hammer on the surface, and by this means, the Angle Ditch was discovered. The sound produced by hammering on an excavated part is much deeper than on an undisturbed surface, a circumstance worth knowing when exploring a grass-grown downland, though not applicable to cultivated ground. Geophysical techniques for archaeological prospecting imply a certain "seeing beneath the soil," a divination which is akin to scrying defined as looking within one medium in order to envision an other matter or time. Such techniques frequently involve the examination of electromagnetic phenomena mapped to location, and a search for anomalous disturbances of local fields. Acoustic and geochemical methods of examination can also be employed. The fieldtrip will examine various approaches to this divining, for example electromagnetic field strength measurement and magnetometer surveying, to assess an important, as yet unspecified Berlin location to be revealed on the 11th of July. Meeting at 1PM [_____-micro_research] to journey to unspecified location. Contact m@1010.co.uk to reserve a place. Free (travel costs not included). 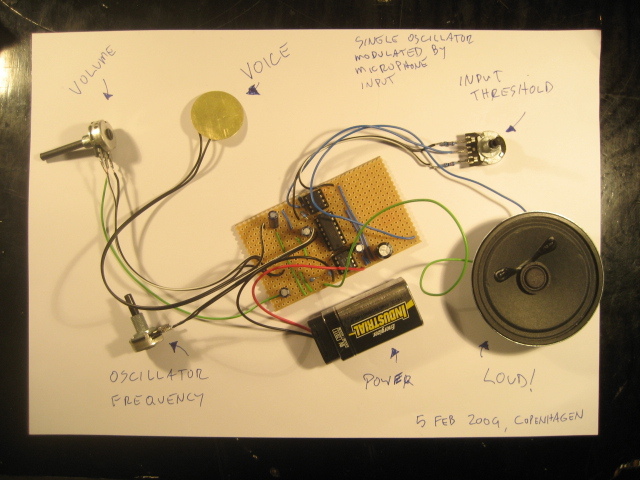 This workshop combines three of the basic building blocks of the longer Neanderthal Electronics workshop (TL072 op-amp comparator, 4093 gated oscillator & LM386 audio amplifier) to create a very crude, caveman-style analog computer for the processing of vocal input through a microphone. Participants will learn some analog and digital electronics basics to create an experimental prototype on the solderless breadboard, then recreate the circuit with permanent connections. They are also expected to bring their own box, case or other object in which to construct the final circuit. The last part of the workshop will touch on how this circuit can be expanded later on to include all kinds of mixers, modulators, distortions and filters through the use of other cheap, easily obtained parts. Derek Holzer (1972) is an American sound artist living in Berlin, whose current interests include DIY analog electronics, sound art, field recording and the meeting points of electroacoustic, noise, improv and heavy metal music. He has played live experimental sound as Macumbista or Derek Holzer–as well as taught workshops in Pure Data and electronics–across Europe, North America, Brazil and New Zealand. Singing and moving solar robots in combination with Schmelzolan. In this workshop the traditional (German?) 70s housewife "schmelzolan" handicraft technique is mixed with DIY analogue electronic and soldering. You can build a little autonomous analogue sound device or a minimal analogues solar robot and seal them in molten schmelzolan plastic forms. Ornamental singing plastic discs for window applications or kitschy kinetic objects (for windowsills or ohp's) can be created. Electronic know-how is not required and all self builded creatures can be taken home. Note that this will be the last workshop before August sommercamp. In common with parent Emacs, the incredibly versatile text editor and all round operating system, org-mode branches out spider-like to creatively embrace a vast range of interests. Presenting a fine example of a healthy free software project, with an active development community, new features are constantly added extending org-mode into the realms of advanced web and document publishing, blogging, mind-mapping, brainstorming, general hypertextual excess, and multimedia management. At the same time, relying on plain old text files for all data, org-mode is both portable and simple to use. This workshop, led by active org-mode contributor Sebastian Rose, will introduce org-mode use and project planning, with an emphasis on publishing by way of XHTML export and LaTeX, org-mode for code management, and a look at possible extension of org-mode and related projects. In search of positronic signal processing we'll offer a starter course for entities interested in modulating electromechanical elements for their work. The workshop will cover basic devices and technologies of sensors(pressure, distance, light, movement) and actuators(motors, solenoids, switches, relays etc.). Control & out of control scenarios will become physical with the help of Pure Data, Arduino and electromechanical devices from the peripherals of usability(trash) brought by the participants. Getting physical and sensory information via Arduino into the computer and playing. Learning more about the communication from Arduino to Pure Data & within Pure Data itself. actuators - putting information back into physical space. Closing presentations/performance at _____-micro-research will take place at 8PM, Saturday 12th September. Positronic Pure Data is supported by Pro Helvetia. Sept 19th 2PM: Make or break: keyboard and effect bending with Klaas Hübner. In this workshop you will learn how to add some nice effects to your keyboard or effect box. Please bring any kind of keyboard, toy, or effect machine and we will open it up, and dig around for some new sounds. With a bit of patience and luck you will go home with a few new knobs or switches on your device to enjoy your next gig even more. Klaas Hübner [born 1979] Student of sculpture and Head of the Audio Studio at Weissensee School of Arts Berlin. He took part as an artist or organizer in several group exhebitions around Europe and performs electronic music as Hiłot Lilanth. He collaborates with different artists for music performances or media art projects. Thought is a radiant, creative, almost material power, the fiat lux of the bible. During the process of thinking, the soul turns the atoms of the brain into waves and makes its phosphor glow. With concentrating ones thought onto any object with simple outlines, like a bottle for example, the fluidic thought image will be forced out through the eyes to expose itself through the power of its glow onto the photographic plate. The result is a photographic image. In "Light Unseen" participants will try, throughout a variety of thoughto - photographic experiments, to focus, force, project and possibly expose thoughts onto photosensitive materials. All necessary materials, including photographic emulsion, chemicals, film, paper and polaroid will be provided. Containers or devices may be constructed here or welcome to be brought along. Thoughts are welcome. Results cannot be promised. Kathrin Günter, artist and photographer has been exploring extensively gossip, star behaviour and the phenomenon of paparazzi photography. Recent researches include thoughtographic theories, practises and other invisible phenomena of the early twentieth century. “/mode +v noise” is a project of GOTO10, a collective of international artists and computer programmers. It is based on IRC, the oldest text-based Internet chat environment. This intervention will transform an IRC chat room/channel into a simple, collaborative, text-based online system for making music. Since IRC allows ‘chat bots’- computer programs that pretend to be human conversation partners -, we will program such a bot to create a collective musical composition environment based on Internet chats. In this workshop, participants will explore two parts of the project: designing sound generators in Supercollider that they can control via a simple IRC bot written in Python. Workshop is taught by Aymeric Mansoux and Jan-Kees van Kampen from GOTO10. PREREQUISITES: This workshop is aimed to beginners, no previous knowledge is required but a basic understanding of computers and an unconditional love for command line and text based interfaces is mandatory! 14:00 - 15:00: hands on demo of the "/mode +v noise" platform and experiment, using the Puredyne GNU/Linux live distro. 15:00 - 17:00: Intro to Supercollider's project botsynth, how to change patterns and synths, explanation of different hardcoded synthdef (from super simple, to more complicated examples). SuperCollider is an environment and programming language originally released in 1996 by James McCartney for real time audio synthesis and algorithmic composition. Since then it has been evolving into a system used and further developed by both scientists and artists working with sound. It is an efficient and expressive dynamic programming language which makes it an interesting framework for acoustic research, algorithmic music and interactive programming. We will deal with practical sound-synthesis, jitlib (rapid prototyping), and get ourselves sounding ready for the irc-jam on the second day. Python is a general-purpose high-level programming language. Its design philosophy emphasizes code readability. Python claims to "[combine] remarkable power with very clear syntax", and its standard library is large and comprehensive. Puredyne is an operating system developed to provide media artists with a complete set of tools for realtime audio and video processing. Puredyne is a live distribution, you don't need to install anything. Simply boot your computer using the live CD or USB and you're ready to start using software such as Pure Data, Supercollider, Icecast, Csound, Fluxus, Processing, Arduino and much much more. GOTO10 aims to support and grow digital art projects and tools for artistic creation, located on the blurry line between software programming and art. GOTO10's members have backgrounds in visual arts, sound art, music technology, physical computing and programming. They have worked around the theme of FLOSS+Art since 2003, using performances, workshops, installations, print, and code repositories as their medium. Go burn your books, and come and learn of me. NOISE_PRODUCE: Concerned with techniques for the elaboration of experimental signal generation; mis-use of digital electronics for the active examination of noise and materiality within the context of industrial electronics, engineering, economy and the event or situation. MAKE YOUR OWN NEURAL NETWORK: This one day workshop is the final part of a series of open experiments and workshops. It materialises all six previous in the creation of a simple autonomous stable/astable CMOS-noise synthesizer unit with a specially expandable neural design model. DIY: ELECTRONIC KNOW HOW IS NOT REQUIRED. Expansive speculation, also continuous confusion is welcome as starting point. Includes all diagrams and schematics, specially developed circuit boards, electronic parts and pieces. All tools are supplied. Electronics construction skills [including soldering, debugging, repairs, own experiments] will be assisted. During the workshop we will explore the contents of found hard-disks (hard-disque trouvé). Using methods borrowed from computer digital forensics participants will peek into the lives of others - former owners of scavenged hardware. Hard-disks as the most intimate part of any computer system. In case of a personal computer - the most intimate part of person's life. Deductively, we will try to discuss and recreate 'psyche' portraits of those strangers and restore the time-lines that otherwise would have faded away. In the times of paranoiac privacy awareness we forget that online is not the only place to loose your identity. Although more and more personal data is stored on the Internet servers it is still written to hard-disks. There were several reports about Internet server's hard-disks ending up on flea-markets, being sold for little money. By the end of the workshop all the hard-disks and/or the data will be destroyed! Everybody is also expected to bring laptops (PC, Intel Macs) capable of booting from USB-sticks or CDs and equipped with USB2.0 interfaces. GNU/Linux command line knowledge will be advantageous, however it is not required. In 1932 Bertolt Brecht formulated a critique of the radio as a centralized mass media, and advocated a decentralized media structure with as many senders as receivers. Ever since, the general notion of democratic media has been, and still is, identical to people getting access to transmitting their own content. From independent grassroot TV makers to pirate radio stations or online digital platforms, the aim has been to create a perfect, democratic media structure by granting people access to the technology. Today though, with a media landscape made up of corporate internet service providers, Brecht's visions seem to have been fulfilled. However, paradoxically enough, by venture entrepreneurs capitalizing on so called architectures of participation. In this workshop we will try to go beyond the general notion of democratic media as a matter of access and instead re-examine the concept by itself. When broken apart, it raises questions around systems of organization and means of control. The workshop is on one side a conceptual framework for the discussion and exploration of participatory media production and the relation between code, content and execution, but also a 'hands-on' introduction to simple commandline video editing. We will develop TV programmes - small scripts that executes video content in different ways. At the end of the day we will turn the space into a pirate TV channel and make a collective transmission out of our TV programming efforts. Please bring video material and computer. Irrational Computing is a loose collection of ideas that includes non-traditional logic gates, non-applied computing, minimal computing, DIY transistors and homebrew CPUs. During the workshop we will build elementary arithmetic and logic units that enable us to realise expandable, networked and looped digital circuits with complex behaviour. We will feed our circuits with binary patterns and explore their visual and auditive responses. The major component of this workshop is the transistor and its switching capability. In addition the workshop will give an introduction and guidance into building handcrafted macroscopic mechanical logic gates. Feel free to bring some potential material (old toys, junk, springs, levers etc.) for logic investigations. Ralf Baecker (1977) lives and works in Bremen, Germany. After studies in computer science he attended the Academy of Media Arts in Cologne. In 2007/2008 he taught at the department for "Design of Medial Environments" at the Bauhaus University in Weimar. Baecker builds kinetic installations and sculptures which interlink symbolic and physical spaces. His epistemological machines explore our imagination of digital processes.